I normally don’t post in the middle of the week, but With Turkey Day right around the corner, I decided to come up with a short post that really captures the spirit of how this great holiday got started. Now, I think we should all list something that we’re thankful for. I’m thankful that our murderous ancestors brought their campaign of irrational hatred to a peace-loving people so that I can eat myself into a diabetic coma every year. I’m sure they would be proud of me. P.S. Wife and I will be out and about this weekend, so you’ll have to get by with this bite-sized post, sorry. Happy Turkey Day! P.P.S. The underwhelmer does not promote Imperialism and feels very, very sorry about what his forefathers did. Please don’t flood me with hate mail. This entry was posted in Funny Section, Main Board, Nerd Section and tagged fat, feast, funny, humor, native american, pilrim, thanksgiving, turkey day, wizard by underwhelmer. Bookmark the permalink. Me too! I’d first and foremost THANK our dearest and most beloved MADIBA aka Nelson Mandela! Sadly though, his very own people are letting him down so badly with an horrendous amount of corruption and whatever else these $ods can possibly get away with. So sad! Truly so sad! OMG, I burst out laughing at work while reading this….I probably shouldn’t be reading blogs at work, but hey – it’s the day before Thanksgiving. I like the way how you draw up the bottom eyelids of your characters when you want to convey a certain expression 🙂 Kind of reminds me of “scarat” in Ice Age. Interestingly, I think around 80% of the native population was wiped out by diseases Europeans brought over from their lands – like smallpox etc. They gave their conquerors syphilis in return. Disease: the gift that keeps on giving. Rush Limbaugh did a great pro-thanksgiving piece yesterday. I live in Texas and listen to some talk radio for “perspective”. He’d really love your post! I really like the illustrations. 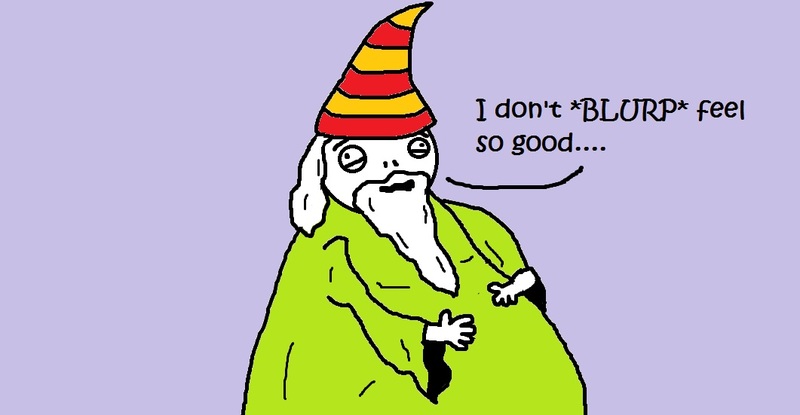 Dig the wizard hat or whatever that is. How many beats did the Pilgrim count to himself before he asked the question I wonder. I’m glad you like my little cartoons. The wizard hat is a personal favorite. I think the pilgram waited for about three seconds before he decided it was time to go all colonial. Yeah, they leave that part out in kindergarten. Fascinating perspective! Don’t most good things come from rotten places……………………..I’m thankful for my family. Is it weird that I find this post both thought-provoking and hilarious all at the same time? I mean, I seriously burst out laughing at the pilgrim saying “I don’t like your tone”…does that make me a bad person?? lol! So ALL those blonde jokes have been fake? Very, very funny! You expressed my thoughts exactly. In a much better way, of course. Okay, we’ll maybe they weren’t my thoughts originally, but I’m going to think them now. I’m conflicted because I have ancestors on both sides. Oh well, either way it’s my land. So get off! I know how you feel. I had grandparents on both sides of WWII. It made family reunions a bit awkward. Which Bush? And if you mean Blair from the 80’s show “The Facts of Life”, don’t you think she’s suffered enough? I mean, she had to share a room with Jo/Joe and she/he had both female/male sexual organs/pianos! Awesome name choice by the way. I’m thankful I found this blog. Nuff said. Thank you, Miss D. 🙂 It’s always a pleasure. I hope you had a happy Turkey Day too. And the Brits call us barbaric……. Hmmmm….wonder where they got that idea from? The pause in the second panel is perfect. Great illustrations! Very kind words! One can always dream, right? Always looking forward to the next update here. Keep ’em coming! hahaha. Happy thanks giving too. I think you might have something there. I love the idea of incompetent supervillains. “I don’t like your tone…” It’s funny how you can make something so sad so funny. Of course, the natives got back at the white man by teaching him how to smoke. This post made my day; have a happy Turkey day and weekend! It’s so true. 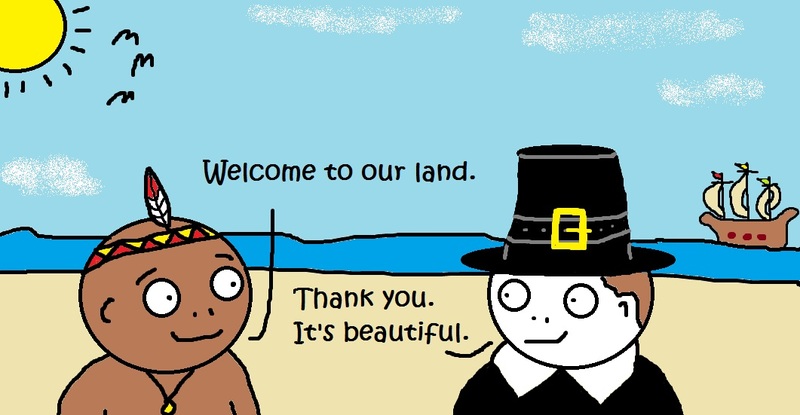 XD I’ve always wondered if the ‘First Thanksgiving’ our teachers harp on so much actually existed, and if it included smallpox infested blankets. Cynical. Hilarious, but cynical. And also true, but we won’t go there. Happy Thanksgiving! I loved this! The simplicity and the quick change of tone was hilarious. I thoroughly enjoy your wit. Thanks for the laugh! Thank you, CallMeMsCrissi. 🙂 I was going for somehting a little shorter than what I normally do. I’m glad you liked it. Mmm. Diabetic comas are the best kind of coma. Wow. You’ve got the nicest blog ever for me in WordPress. You attract and make others laugh like crazy at their seats. I hope I’ll get an idea that will attract people and at least help me from my problems. HA! There’s no turkey day in the Philippines, only turkeys. And it’s expensive here. Aw, thanks! I’m really glad that you like my little blog. 🙂 I don’t think you’re missing much with Turkey Day. We just eat a bunch of food and feel bad about it afterward. 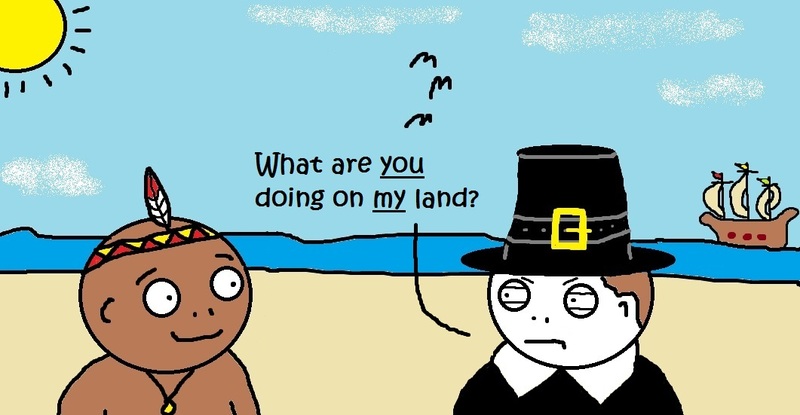 Too funny – and I don’t even come from where Thanksgiving is celebrated!